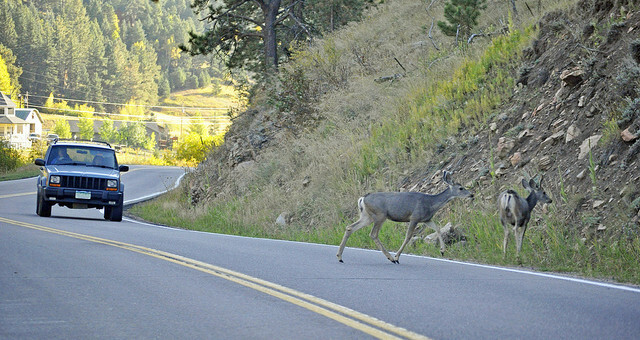 Collisions with animals while driving is common, particularly in country areas. Read our post on avoiding collisions with animals for information on how to prevent this situation. Despite your best intentions and preparations, this unfortunate situation does occur and it’s important to know the relevant authorities to contact and how you should treat the injured or killed animal. Pull over where safe and activate your hazard lights. Make sure everyone in the vehicle is ok.
Keep calm while dealing with the situation. Accidentally hitting an animal is not going to get you in trouble, but if the animal is alive you should make sure it is taken care of. If the animal is still alive it will be panicked and potentially dangerous. As such, you should slowly drive back to the animal instead of getting out and walking. Assess the situation to check it’s safe to go outside. A live animal could see your presence as a threat and attack. If the animal appears to be young, be aware that its parents would react very poorly to finding you near their injured child. Never approach snakes, lizards, flying-foxes, bats, large kangaroos or birds of prey as these animals require specialist handling carried out by trained wildlife rescuers. If safe, leave your vehicle and approach with caution making sure that passing traffic is not a danger to you. If it is safe, you should remove the animal from the road so it does not create a dangerous traffic situation for other road users. Check for baby animals in the pouches of dead adult animals. Animals found alive in a pouch should be treated as injured animals (see below). If the dead animal is a pet - try to contact the owner, police or the RSPCA. Maintain a safe distance as the animal is probably terrified and could be threatened to the point of attacking. You should call the RSPCA's emergency hotline on 1300 ANIMAL (1300 264 625) for advice on how to proceed. Depending on the animal you may be required to take it to the nearest vet (most vets will take wildlife free of charge). Let them know if you can't transport the animal safely. The RSPCA also provides an Animal Ambulance service. This means trained handlers could come to you to rescue the animal. After receiving vet treatment, the animal should be given to the relevant carers as it is an offence to keep wild native animals. Visit the RSPCA website for more information. If a pet is injured, take it to the nearest vet. From there, try to contact the owner, police or the RSPCA. A collision with a large animal at speed is likely to cause significant damage to your vehicle. Take pictures of the scene and damage to the vehicle as evidence for insurance purposes.